We are at the top in law enforcement instruction for over 16 years…Rolling Surveillance™ (the original mobile and foot surveillance course with creative response techniques to counter-surveillance), Auto Theft Investigators Training – Chop Shop Investigations, Sophisticated Organized Crime, and Undercover Field Operations (Undercover Police Classes) will give you expert teaching in the classroom and hands-on coaching in the field. We are the best choice in helping you improve your undercover police surveillance skills. 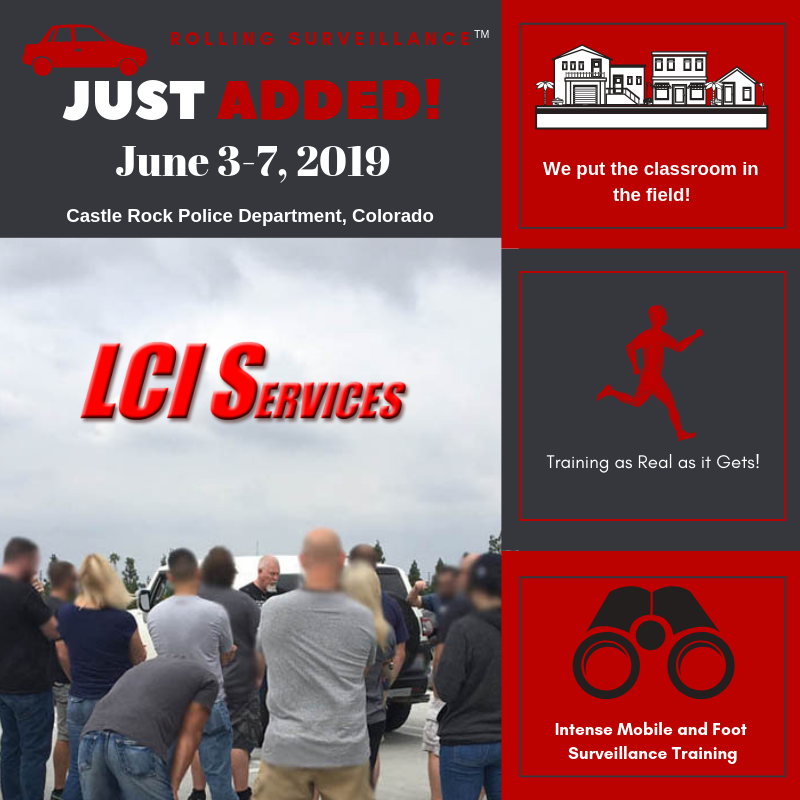 Our attendees will tell you they learn the most from our unique hands-on teaching, and greatly improve their surveillance success while having fun. We spend more time in the field than in the classroom, where you apply the techniques we teach you. Our debriefings clean up any errors to get the job done right! We bring in the best role players and design realistic scenarios for you to practice in the streets and on the freeways. We instruct in beginning and advanced mobile/foot surveillance, counter-surveillance and CS response techniques, intelligence gathering, and how to document and testify for a strong court case. In Undercover Field Operations…learn and practice creating your undercover profile and blending into your environment during your buy/walk. In Chop Shop Investigations…you’ll be taught VIN switching and ID techniques, levels of sophistication in organized crime, and scene processing. While technology often fails, human surveillance captures the face to face, making doors, and visual evidence required for court. We bring the best in techniques, producing the desired results time and again. We do all of this out in the field, giving you the hands-on training you need to succeed. We put to practice everything you will learn. Our topics include, but are not limited to the following: Sophisticated Criminal Individuals and/or various groups of Organized Crime involved in Vehicle Theft, Chop Shop activities, Insurance Fraud, Identity Theft, Internet Fraud, Money Laundering, Drugs and Narcotics, and other related crimes. If your agency or organization is interested in hosting/contracting law enforcement and/or insurance investigator classes in your region, please contact us for more information. We also do refresher courses for those departments or task forces who’ve taken our training, but want to update, refine, or personalize it. Surveillance Expert, Tim Lewis, is also available as a speaker or consultant for seminars, conferences, cases, and media.